It hasn’t happened yet, but we may soon find ourselves in a world where virtual reality and everyday reality are all but indistinguishable, and equally ubiquitous. And to prepare ourselves for that, we’re obviously in dire need of a VR headset that isn’t bulky, absurd looking, expensive, or all the above. So here to fill the void in our lives is Figment VR, the world’s first VR and AR phone case. Constructed with polycarbonate plastic coated in silicone rubber, the VR viewer’s bridge is made of a high grade anodized aluminum and features scratch-resistant lenses. When you need to view something in VR, the bridge extends to maintain the proper distance between your eyes and the screen, and when you’re done, you can simply fold the viewer back into the case. Promising to democratize the way in which people interact with and access virtual reality, the slim and sleek design of Figment VR is the ultimate in accessibility — and because it’s a phone case, it goes anywhere your smartphone goes (which, let’s face it, is everywhere). Triggers located on the sides of the case open the VR viewer, and users can then select a VR app to view an experience. 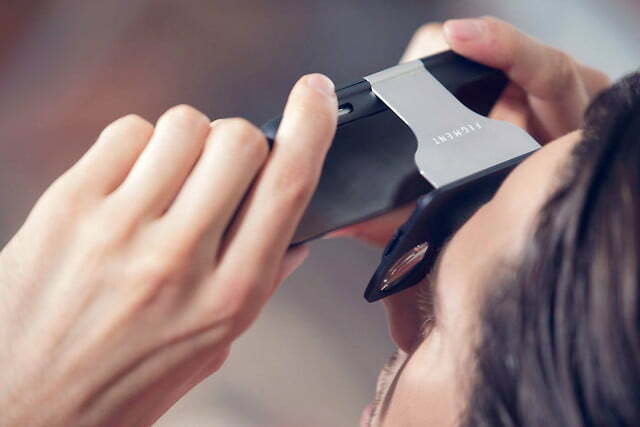 The phone case itself then “serves as a lens to explore VR content through apps like Google Cardboard, Jaunt VR, Vrse, and more,” notes the device’s press release. Put simply, Volta Flyer is a solar-powered toy airplane designed by educational toy maker ToyLabs. But unlike other DIY airplane kits, the Volta Flyer mixes a bit of science into the fun, allowing children to learn some mechanical engineering, flight mechanics, and electronics as they assemble the solar flyer. The self-built, science-focused kit can help kids “gain practical insights into STEM (Science, Technology, Engineering, Math),” writes ToyLabs in its Kickstarter description. The Volta Flyer sets itself apart from other hobby planes by using a solar panel to provide the power necessary for motorized flight. No batteries are required to turn the prop, just find some good ole sunshine and your child will be launching his/her plane skyward. The assembly also is very child-friendly, and requires no glue, special tools, or special skills. It really is as easy as following the instructions and clicking the pieces together. Assembly reportedly takes less than 20 minutes, which gives you as much time as you need to decorate the plane with stickers, markers, and more. 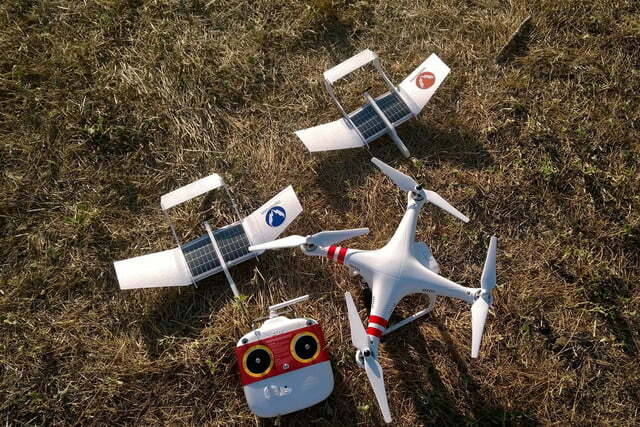 Once assembled, you only need to wait 90 seconds for it to charge in the sun before it’s ready to fly. Snacking on insects might sound like an outrageous idea at first, but once you start looking at the facts, it starts to make a whole lot of sense. It’s time to change your perception about eating bugs. I mean, sure, you’ve probably eaten one or two at some point in your life — maybe it was a chocolate-covered grasshopper somebody bought you at an airport gift shop, or maybe you just forgot to wear a motorcycle helmet that one time, but now it’s time to fully embrace the idea of bugs as a legitimate food source. Due to rampant population growth, scientists predict that global demand for meat will double by the year 2050. That’s demand that we just can’t meet. The cattle industry already accounts for roughly 50 percent of our water use, and crops used for cattle feed take up 10 percent of our arable land. In other words, the time has come to start exploring alternative sources of protein. That’s where the Livin Hive comes in. 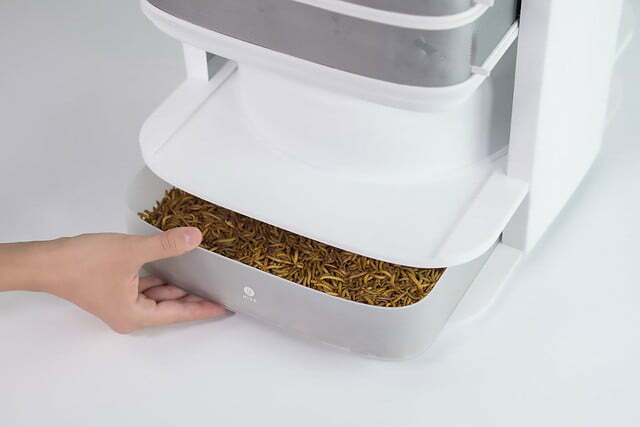 It’s essentially a desktop insect farm designed to house mealworms through all phases of their lifecycle. There’s a loveshack for the beetles to mate in and a pupation department for hatching. The hive also has fans and ventilation to deal with excrement smell and sensors and heating elements to make sure your bugs stay safe before you grind them up into dinner. It sounds gross, but they’re packed with protein! The humble wireless router is now a staple of most American homes, but many of us only use the standard, crappy device our Internet Service Provider (ISP) sends us when we sign a contract. A new crowdfunding campaign is attempting to break that cycle with a device that offers a great deal more functionality. The Turris Omnia is pitched as ‘more than just a router’ in its project brief on Indiegogo. In addition to offering a reliable wireless connection, you can also use it as a home server, print server, or as part of a Network Assisted Storage set-up. 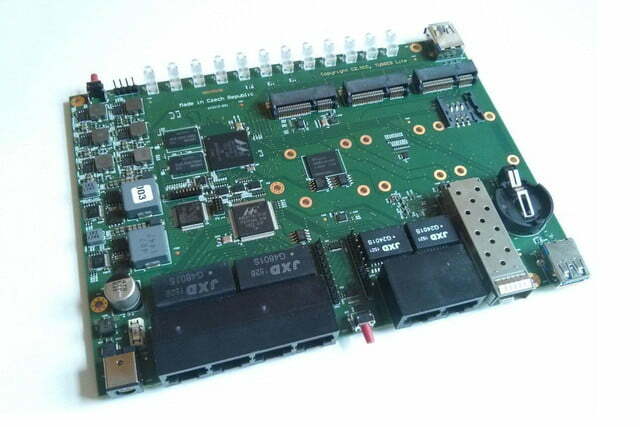 What’s more, it’s completely open source, with open hardware running a free OS that’s based on OpenWrt. According to the project’s creators, this gives the Omnia all the capabilities of a standard Linux server, which opens up a host of possibilities. Security is also a big feature for the Omnia. The device’s firmware updates will be automated, which gives it a huge advantage in stamping out possible threats. Users will also be able to monitor the activities of network attackers directly from their system. To make all this happen, it runs some pretty beefy hardware. With a 1.6GHz dual-core ARM processor, 1GB of DDR3 RAM, and 4GB of flash memory, Omnia is more than capable of keeping your network safe, secure, and fast. Paying for replacement razor blades is one of those things that’s universally hated by practically everyone who shaves. 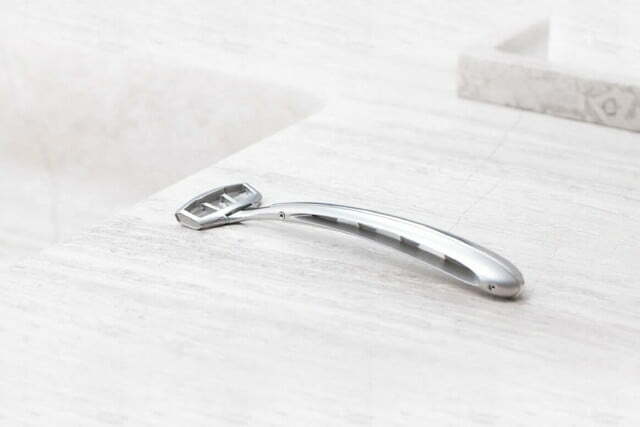 Sure, you can always go the Dollar Shave Club route to save some money, but if you’d rather not burn a bunch of cash just to keep your fur at bay, you should definitely check out this brilliant new sapphire razor blade that just hit Kickstarter. It’s called Zafirro, and it’s built around the idea that metal isn’t necessarily the best material for a blade. It’s generally accepted that razors get dull over time after coming in contact with your hair — but that’s not actually the reason it happens. Instead, razors lose their sharpness because their edges are so incredibly thin that reactions with water, air, and oxygen cause them to corrode. Constant exposure to water and moisture causes the paper-thin cutting edge of the metal blade to rust and flake away, which shortens the effective life and forces you to buy new blades. Zafirro doesn’t have any of those problems, because it’s made from sapphire instead of steel. Plus, in addition to being corrosion resistant, it’s also sharper than a traditional razor — so you get the best of both worlds. Is China looking to build its own secure smartphones?